Need ideas for an antipasto platter? 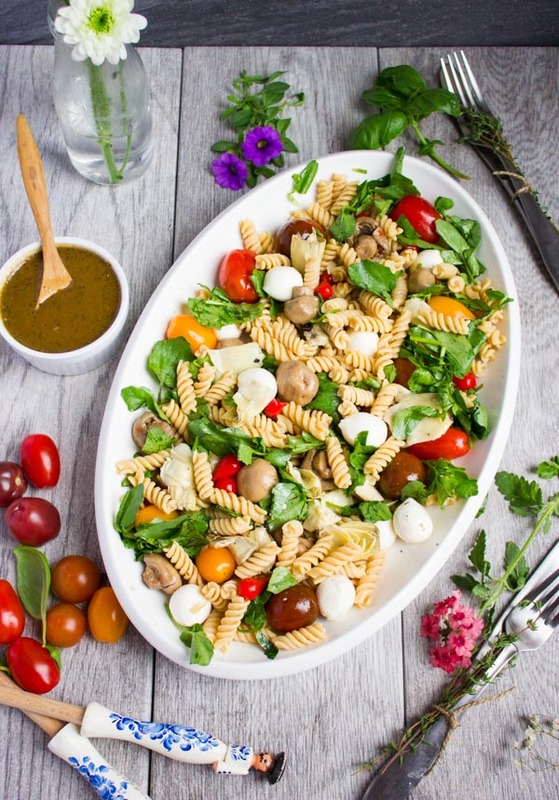 Why not serve a warm antipasto pasta platter with a fragrant balsamic basil sauce, mozzarella, and tomatoes? 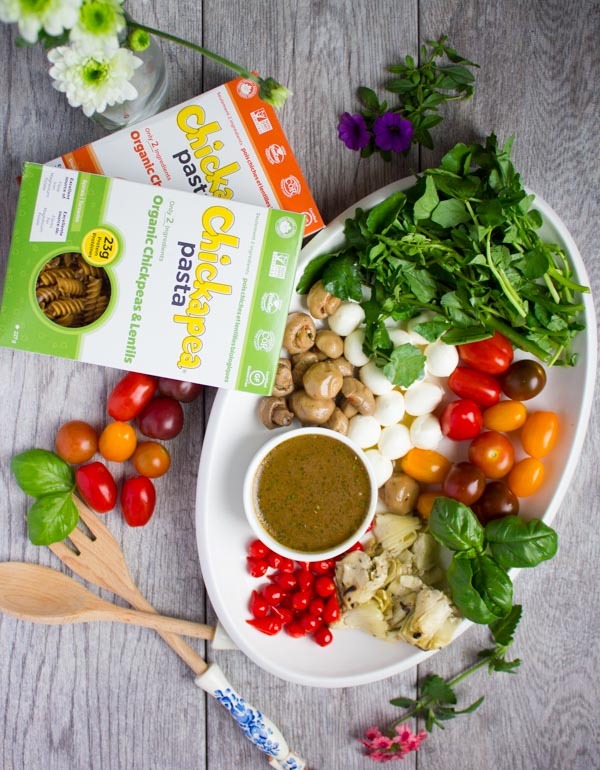 This warm Antipasto Platter with Chickpea Pasta is a perfect cross between your antipasto platter favorites and pure pasta comfort. Perfectly combined in a sweet tangy warm basil balsamic no-cook sauce. It’s the type of recipe you can whip up in minutes and totally personalize it to suit your taste! Hello, easy Summer lunches! First of all, this antipasto platter recipe happens to be light as air. It tastes bright, sweet, refreshing and rich with all the Italian flavors and Italian comfort. I remember when I was a kid and used to live in Paris, we used to visit Italy regularly. I was mesmerized by the fabulous food in both places. And even if food wasn’t as neatly displayed in Italy as it was in France, it looked just as mouthwatering! It tasted just as delicious! It’s probably the freshness and comfort of Italian flavors. And that’s the inspiration for today’s delicious mouthwatering antipasto platter pasta! 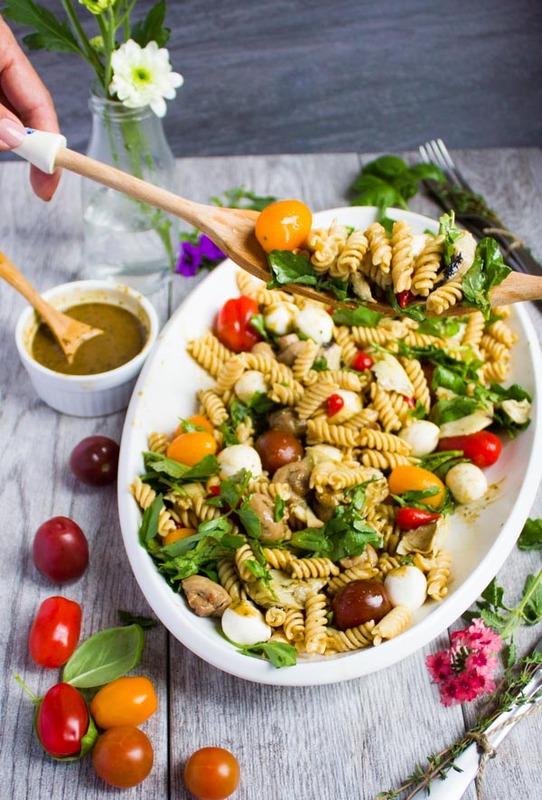 The beauty of a warm pasta like this one is that you can pick your favorite antipasto platter ingredients and throw them in. You can’t go wrong. If I were to serve this alongside something grilled, I’d probably choose grilled shrimp or chicken skewers. It would make this antipasto platter pasta feel like a luscious gourmet Italian dinner. I wouldn’t go for a heavy spiced grilled protein since there’s plenty of flavor in the pasta already, and plenty more extra flavor from the sauce and toppings. Something like garlic, lemon and oregano would be all I need to flavor my chicken/shrimp for the grill. It would compliment all the flavors beautifully and most of all, it will remain light and fresh tasting. And when you make it using the pasta, then you’ll get the protein bonus with a hearty feel to your dinner! 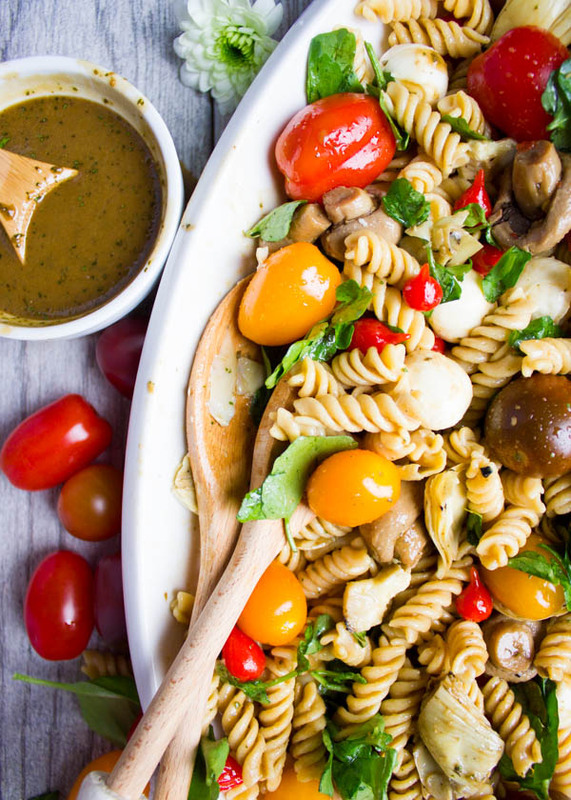 Here’s how easy and quick this delicious pasta platter comes together. Boil the chickapea pasta with some salt. In the meantime, use your food processor to blend in some garlic, honey, basil, parsley, balsamic vinegar, parmesan cheese, chili flakes, olive oil, and anchovy paste (optional but SO good!). Once the pasta is done and while it’s still hot, drizzle half of the balsamic sauce over it and watch as it soaks up all those flavors. At that point, add your favorite antipasto platter ingredients—go as crazy or as minimal as you like: watercress, baby heirloom tomatoes, bocconcini, grilled artichokes, sweet marinated peppers, grilled marinated mushrooms, olives, capers, salami, prosciutto, more fresh basil and plenty of Parmesan cheese shavings. 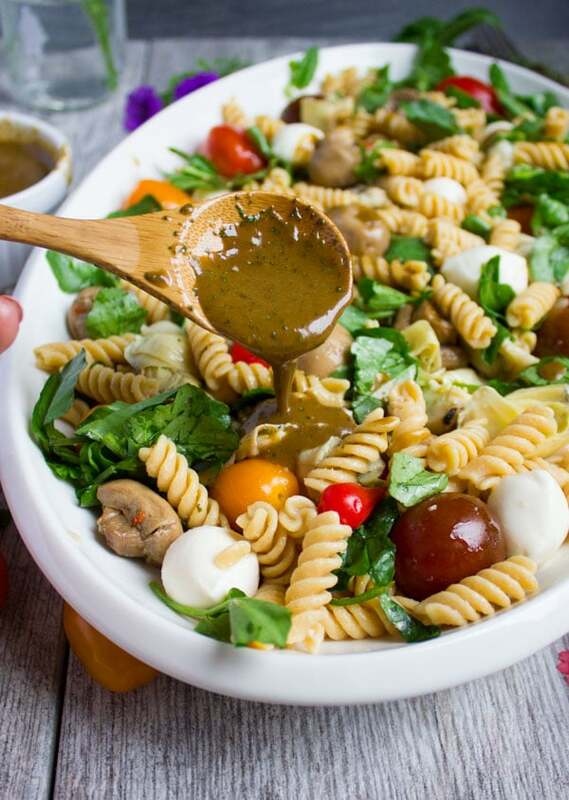 Drizzle some more basil balsamic sauce and invite your friends to dig in! It’s a perfect dish to share! For a party, you can serve all components individually so that everyone can personalize it to their taste! I would cook my chickpea pasta perfectly al dente and keep it warm drizzled with half the sweet basil balsamic sauce. Then I’ll have all the antipasto platter add ons separate like an antipasto bar. Have your friends each add their favorite toppings and any extra sauce. You can serve this antipasto platter warm or cold. So not only is it great for the BBQ, think picnics and beach food, potlucks and any outdoor fun. Also, you can make different versions of it every time and it’ll feel almost like a new recipe with every variation you make to it! I personally prefer no meats added to this pasta, but if you’re into salami and cold cuts, you’ll find it might taste even better! Need ideas for an antipasto platter? 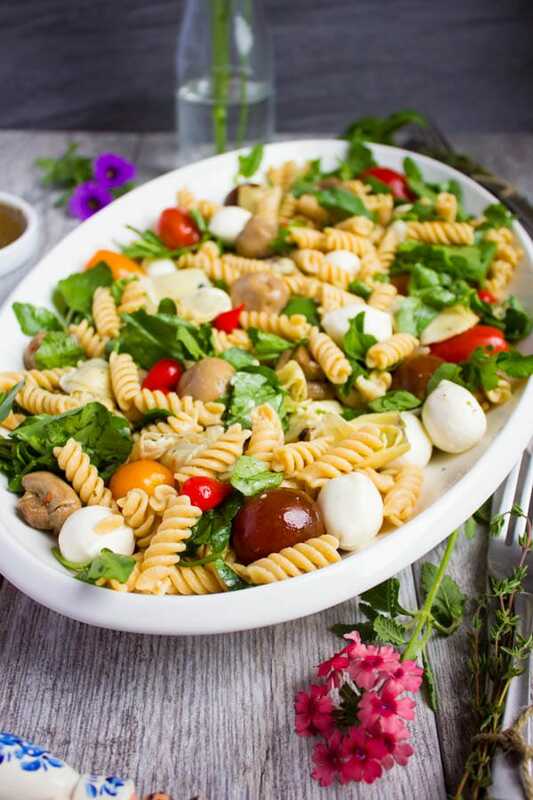 Why not serve warm antipasto pasta platter with a fragrant balsamic basil sauce, mozzarella, and tomatoes? Cook the chickapea pasta in salted boiling water till al-dente. In the meantime, use your food processor or blender to make the sweet balsamic sauce. Add all the ingredients and blend till smooth. Taste and adjust the seasoning. 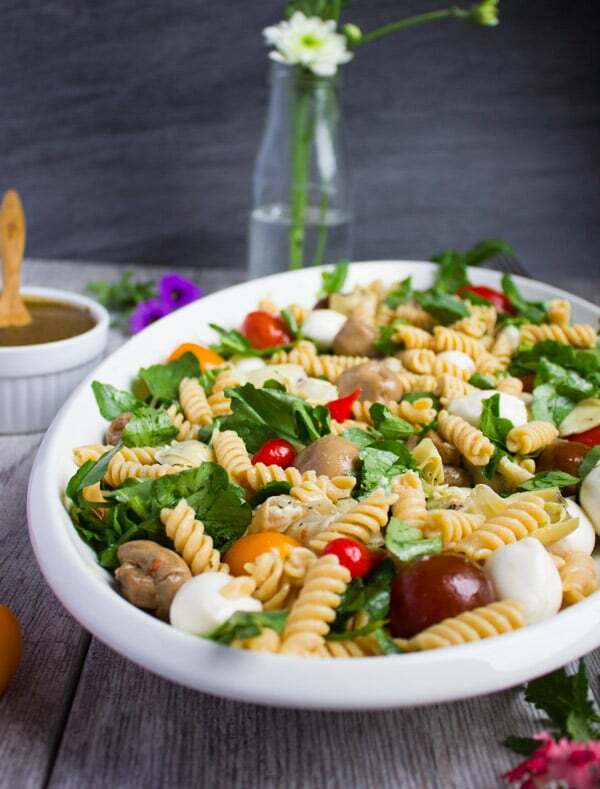 Toss the hot cooked chickapea pasta with half of the balsamic sauce and toss in your favorite toppings. OR you can serve the toppings separately and the pasta separately like in an antipasto bar and have everyone assemble their pasta platter to their taste. I personally prefer no meats added to this pasta, but if you’re into salami and cold cuts, you'll find it might taste even better! Love the watercress in this dish– such a powerful and tasty little green. 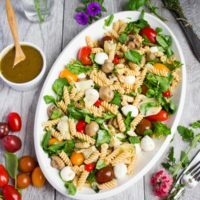 I love cold pasta salads, and this one has great flavors and colors! This is such a beautiful recipe! Seriously, the best looking antipasto platter ever. And isn’t Chickapea Pasta incredible? We eat it all the time!! Mahy! Antipasto in pasta form?! Why hasn’t anyone thought of this before??? BRILLIANT. Also: Look at all the goods and protein in that Chickapea pasta. This is a meal for ALLLLL the Summer get togethers for sure. I just love this dish, Mahy. It will make serving guests over the summer so easy and delicious. You always come up with the perfect dish for parties! You’re the Martha Stewart of the blogging world 🙂 Sharing! Sooooo I’m thinking you don’t live so far away after all Mahy! I’m coming over for lunch! This pasta is seriously calling my name! hahah Taylor–come over anytime!! I’ll make this for you any day! 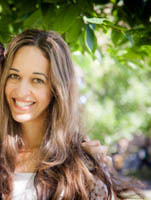 Thanks for your kindness Teri!! I’m in love with chickapea pasta too!! Thanks Tricia!! Hope you make it soon! Thanks Marcie! Hope your family loves it too! 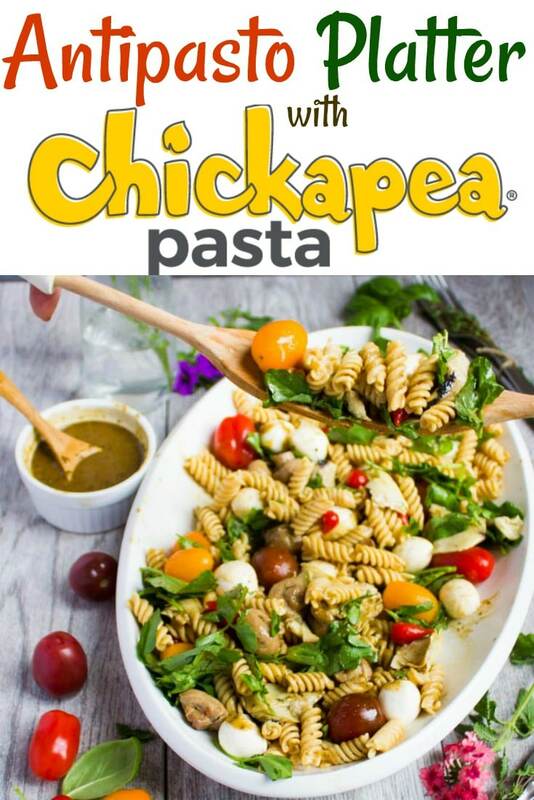 I’ve never heard of chickpea pasta before! Where can we buy it?